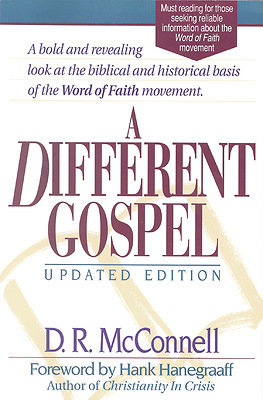 "A Different Gospel," a book for the heart and the mind, is must reading for those who seek reliable information about the "Word of Faith" movement. Every Christian should read this book in order to be aware of the dangerous implications of the widespread and cultic "Word of Faith" movement preaching what is popularly known as ""Name It and Claim It"" theology. "A Different Gospel" is a bold and revealing examination of the biblical and historical basis of this movement. This new and revised edition is complete with a foreword by Hank Hanegraaff, author of "Christianity in Crisis," and a new afterward by D. R. McConnell. The author knows the movement first hand and has a heart for those snared by it. He is also an academically trained observer who has based his work on careful historical and biblical analysis. McConnell warns of the movement's cultic nature in its doctrine of healing and its understanding of the atonement and demonstrates how far the movement's doctrine of prosperity is from Scripture's true teaching.